When you seek physical therapy treatment at a Westchester County, NY physical therapy clinic, you may find they use a number of treatment options to help you feel better. Most people think of the physical exercises used, but there are other alternatives that may be taken advantage of, including something called kinesio tape. This stretchy cotton-based tape can provide a number of benefits when used by a physical therapist. A physical therapy clinic may use kinesio tape. Pain Relief – The tape removes pressure on pain receptors located directly below the skin or by providing sensory stimulation to nerve fibers. Reduction of Swelling – One of the biggest issues with injuries is swelling. Kinesio tape creates negative pressure that allows for drainage of the lymphatic system, which is what contributes to swelling after an injury. 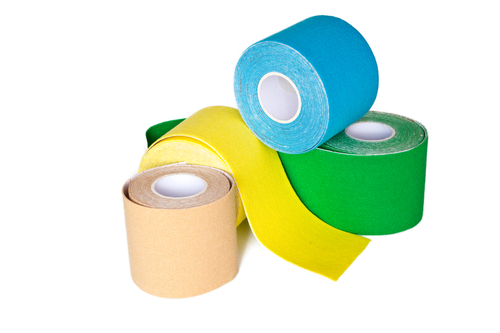 Reduction of Muscle Fatigue and Cramping – This type of tape removes lactic acid, which is produced during exercise and attributed to muscle fatigue and cramping. Support for Weakened Muscles – After an injury, muscles in the injured area can weaken due to disuse. Kinesio tape provides support so you can heal more quickly from your injuries. The tape can also be used for this purpose during daily tasks. During your physical therapy treatment, your physical therapists in Westchester County may recommend the use of kinesio tape for a number of reasons. A Westchester County, NY, physical therapy clinic is most likely to use this tape to help individuals who have been injured. This is because of the incredible benefits shown to help with swelling and muscle fatigue, both of which are common in injuries of all types. There are many tools physical therapists use to help their patients heal more quickly so they can get back to playing their sport, doing their job or going about their daily activities. Kinesio tape is one of their most useful tools when dealing with injuries of all types. If you’ve been injured and need physical therapy treatment, contact us. Our Westchester County physical therapists can use kinesio tape to help speed your recovery.